The Guild Master – Viv Nobbs, supported by Vice-Master – Christine Hill, Hon. Gen. Secretary – Mo Routh, Hon. Gen. Treasurer – Mike Bubb and Minute Secretary – Tony Smith, opened the meeting at 3 p.m. The Master welcomed all present, introduced the top table and thanked the Winchester District for hosting the event, Elizabeth Johnson and her team for providing refreshments, the incumbents and tower captains for the use of their bells, Sue Armstrong for taking the service and Gary Davies for playing the organ. She said a short prayer to open the meeting. 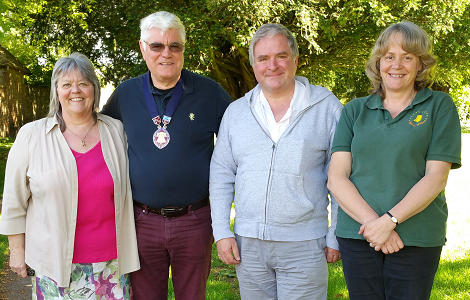 i) John Croft (unattached), Alan Hoar (Odiham), Maureen Routh (Steep) and Ronald Tipper (Buriton) had completed fifty years’ ringing membership of the Guild and the Master presented them with their life membership certificates. ii) On behalf of the Executive Committee the Master proposed, and the Vice-Master seconded, Mike Bubb and Tony Smith for election to life membership in recognition of their exceptional services to the Guild. The Master added her personal thanks for their support during the past three years in her role as Guild Master. As chairman of the CC 2016 organising committee, the Vice-Master said there had been reports inThe Ringing World and on the Guild website. The arrangements had included 21 towers open, including 3 on the Isle of Wight, a Social Evening, Dinner, Lunch, committee meetings, and the AGMs of the Council and the Ringing World Ltd. The W&P had been widely acknowledged as a welcoming and efficient host. The Master had used the weekend as an opportunity for public relations initiatives and there had been features in Pompey Chimes and on Radio Solent, Isle of Wight Radio and Premier Christian Radio. The Vice-Master thanked all those who had helped including the committee, Michael Church, Charlotte Colliss, Mo Routh, and Tessa and Tony Smith; David Mattingley who organised 280 pints of real ale; Claire Partridge for designing the brochure; John Davey and Robin Wilson for the photographs in the RW Calendar; and Rosalind Martin for information on the Guild website. The aim had been to break even but in the event a surplus had been generated and the Executive Committee would consider how it should be used. The Master added her thanks to all concerned. There were no nominations. Maureen Routh offered to continue in the rôle on an informal basis until the November Executive Committee meeting when the vacancy could be filled. 12. The retiring Master invested the new Master with the Master’s Badge. The inter-district 8 bell competition on 2nd July and 4 districts entered. The changeable weather didn’t affect spirits and everyone undertook their practice and test pieces with gusto. Well done to all the teams and thank you to our Judges, Paul and Kate Flavell! Final thing, the date for the Inter-tower 6 and 8 bell competitions will be 20th may 2017 and the date of the inter-district 8 bell will be on Agm day, 17th June 2017! Congratulations to Portsmouth District Team Members Rachel Byford. Ali Hunt. Sarah Hutchinson. Andrew Byford. Jim Twiney. David Atkins. Ian Hunt. David Mattingley. The election of new officers for the Guild at the AGM yesterday was very successful overall – the officers led by Viv Nobbs for the past three years were able to hand their responsibilities over to the strong new team led by Mike Winterbourne. New faces include Mike Winterbourne the new Master, Vice-Master Pete Jordan, and Treasurer Ros Brandwood who will sit on the top table at Exec meetings alongside Tony Smith who remains as Minute Secretary. New Central Council Reps Allan Yalden and Andrew Johnson will serve from 29th May 2017, replacing Tony Smith and Viv Nobbs who remain in their current CCCBR roles until that date. 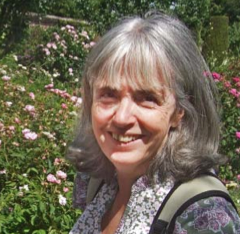 Viv Nobbs, who stepped down as Guild Master, became Public Relations Officer. The key job of Secretary which has been done by Mo Routh for the past 3 years, was not filled. I have offered to caretake the role as a volunteer for (hopefully) a matter of weeks while the new officers settle in and they have a chance to find someone to take it on. I have set a limit on this and if there is still no volunteer by the November Executive meeting, I shall step down and the Guild will have no secretary and the things I deal with will have to be taken on by other officers. I hope it won’t come to that, and that someone else becomes secretary very soon. David Mattingley will be reporting, from the Central Council Conference 2016, to our A.G.M. tomorrow. So, a good time to come forward to serve as a Guild C.C. Rep. maybe?? Help to shape the future of The Central Council and ringing? Hope to see you at New Alresford on tomorrow! The Guild’s Action Plan Review will be presented to the Annual General Meeting on Saturday. It’s hoped that many members will be present but not all will be able to join us. I thank members for supporting Officers with the Action Plan and thereby enabling us to take a more flexible approach. I have appreciated it very much and wish to keep my part of the bargain by presenting this review; I strongly believe in transparency and accountability to members. I do hope this will encourage even more engagement leading to positive outcomes. The Review is linked here and included in full below for your information; I hope you find it helpful. A budget review by the Executive Committee in November, using part-year figures, to include consideration of a positive policy regarding payment of expenses for Officers, maybe Tutors, in order that we might be prepared and in a good position to encourage members to volunteer with confidence and, if they wished to do so, claim expenses. Consideration being given to the setting up of a Young Ringers’ Fund. A volunteer coming forward to act as a Young Ringers’ coordinator, hopefully resulting in an increased number of our young members meeting together frequently to give them more benefits from ringing and social activities. A volunteer coming forward to serve on the Striking Competitions Committee with Greg Jordan and Peter Niblett and for all ringers to encourage increased enthusiasm and participation in the Striking Contests. Firsts Fortnight – ‘though it was not an actual coming-to-meet-together event, it proved very popular and was reported as being very successful. It certainly seemed to inspire many members of all experience levels. It was very evident that many ringers and other groups from across the country were watching the event’s progress and were commenting on its obvious success, especially on Social Media. Two Inter-Tower Striking Contests (the competition rules were amended to encourage more entries) and, on the same day, two open towers and a skittles and lunch informal social occasion. Basingstoke District was able to give its support at the competitions’ venues and The Master undertook the open towers and social event. All seemed to be enjoyed and appreciated by those attending indicated by a good number of entries from local towers – especially for the 6-bell contest – and, the social side, by those travelling the greatest distance. Guild A.G.M Day 2nd July 2016. Open towers, Inter-District Striking Competition, Ploughman’s Lunch, Church Service, Association of Ringing Teachers information hub, informal showcase of Centenary of end of World War 1 project, Annual General Meeting and light refreshments. b) We have aimed to continue to encourage Districts to be independent of central control and to be Ringing hubs and cross border co-operation continues to be evident and encouraged. Guild support by way of the new website has been reported as working well. c) The inventory of Guild resources has not yet been completed. Some items are listed on the website. Association of Ringing Teachers – “Sarah Beacham Memorial Trust” – awards; all did well and Brighstone won an award. The prize is likely to be a sum of money. e) The Guild has been encouraging Young Ringers and their local leaders, generally. Specifically, the Guild has made a financial contribution of £440 towards the costs of travel for two separate Striking Contests. The first ever South East England Young Ringers’ Competition in Epsom Common, Surrey – a joint team was entered from Guernsey and The Isle of Wight – and the R.W.N.Y.C. being held on 2nd July will see a band comprising ringers from the Christchurch and Southampton area working with the Isle of Wight. It is hoped and anticipated that these two events will encourage even more young ringers and their supporters, from across our wide area, to enjoy more ringing and social events. Committees are seeing young ringers coming forward to serve, for example Belfry Stewardship and Striking Competitions. f) The Executive Committee and Officers have reviewed Administration taking into account members’ feedback and availability of resources. The amount of volunteer help being offered has an impact, so prioritising tasks has been needed. Generally, we have been more successful in recruiting help for specific tasks rather than members being willing to stand for a specific period in formal posts. A focus group has been formed, to be chaired by the Guild Report Editor to consider the content, format and production costs of the Annual Report. Since it was announced that The Ringing World National Youth Contest was to be held on the first Saturday in July, for the foreseeable future, the decision was made to bring forward our Annual General Meeting by two weeks; this was to send out a strong signal of commitment to our younger members and should avoid the National 12-bell contest. The general meeting will fall close to the anniversary date of the formation of our Guild. g) We have been sending out the message, at A.D.M.s and in written form, imploring members to engage further, especially by using the website. a) Communications: The new website was developed and launched. Taking into account the technical experience and personnel available and listening to the advice of the Communications Team, it was decided to make the development and launch of the new website the priority action. A data base of members is considered to be a priority still as is an overall review of how information is circulated to members, including more newsletters, in addition to the website. b) Education: an Action Plan budget of £1,200 was earmarked. No District came forward to apply for the £500 (maximum) “District initiative” element ‘though one District has made its intention known that it will very likely apply in the year 2016-17. The Education Committee has not applied this year for the financial benefit of £200. It will review in the Autumn as hall hire is increasing generally and the benefit of lower student numbers on some courses is apparent. Especially, in the light of the above, The Master has used discretion with The Teacher Training element of the £500 approximate budget. 3 out of 8 Districts have applied for this support this year. £180 has been allocated in the following way: 9 students have claimed and will be paid £20 each. It has been considering the completion of the Bell Stock Survey, especially as the records had been found to be very useful at Ropley after the serious fire. d) Recruitment and Retention: we’ve aimed to promote the application of good publicity and striving for excellent training, hand in hand, to improve the prospects of recruitment and retention. Financial incentives are available within the Action Plan for Training Tutor courses. In addition, a focus group has been established recently; the initial purpose has been to investigate and introduce if necessary, the possibility of teaching schools within our Guild. The group is financially and administratively separate from other Guild committees. It will act harmoniously with them, of course. The group will report to the Executive Committee later in 2016 and might require some funding. a) Hosting of the Central Council Annual 2016 Conference and to provide the material for the Ringing World calendar. All of this went very well indeed. A number of members produced excellent photographs for the beautiful calendars. Christine Hill did a magnificent job – she’d accepted full and overall responsibility; she chaired the local organising committee, kept everyone motivated and on target. Extra volunteers (including a ringer from Sussex who knew “W and P” via Social Media) gave their time over the actual weekend of the conference and main events, including at many open towers. All volunteers were very committed, reliable and much appreciated. “I know that making all the arrangements for the weekend gathering would have involved substantial work. You and your colleagues deserve all the thanks you will have received from giving everyone such a good experience of Hampshire and the Isle of Wight along with many church towers. I add my thanks for all that you have done to enhance the profile and reputation of the Diocese of Portsmouth. b) Hosting the Association of Ringing Teachers Annual Conference 2017. The venue has been booked for the two days in Basingstoke. It is anticipated that a small group of volunteers will carry out the necessary local organisation of this event, much less in size than the Central Council’s conference visit. c) Event to mark the centenary of the end of World War 1 and to record commemorative ringing. Two volunteers have taken on this project with much enthusiasm and commitment. An opportunity to include ringing in our towers from 1914, to honour and remember personnel killed during the conflict, has been recognised and grasped. Third parties have recognised with us the potential benefit of this project to portray a positive image of our ringing community. It might well assist with our recruitment efforts. This project will report to the Executive Committee later in 2016 and is likely to require funding, some from the Guild and it’s anticipated that an application will be made to the Heritage Lottery Fund. d) Recruitment Drive and Retention of Ringers. Together with the new focus group looking at the possibility of Ringing Schools and its liaison with local leaders, the use of good publicity and promotional material should dovetail well with a view to a recruitment drive. … for each event are available if you click the location on this page. using the form below by Monday 27th June: booking essential. We are still to hear of volunteers for several posts, including those for Hon. Treasurer and Hon. Secretary. These two Principal Officers are vital for the Guild’s smooth running and continued progress. I’d be pleased to chat over specific details if anyone has a mind to consider standing for election. Bruce Purvis has advised that he wishes to stand again for the post of Hon. Librarian and Archivist. Peter Clarke has advised that he will stand again as Independent Examiner. Pete Jordan of Basingstoke District has declared he would like to stand as Vice-Master. I would like to take the opportunity to introduce myself to those of you who don’t know me, as well as to reach out to those of you whom I either know, or our paths have crossed as ‘nodding acquaintances’ from time to time at Guild events. I have been a member of the Guild for around 25 years, as member of St Michael’s church in Basingstoke where I have in the recent past held various positions including Tower Captain for 5 years, Steeple Keeper and Treasurer. For me, the pleasure of ringing is not only self satisfaction, but also to help others to develop their skills in the tower. Within my own tower this may include bespoke practices to benefit learners specific requirements, quarter peals to give them the opportunity to both learn a method well and to enjoy the reward of achievement, and generally supporting all of the ringers in their goals and ambitions. I am now seeking to spread my wings a little in support of the Guild and would like to offer my services as Vice Master at the upcoming elections. Personally, I look forward to learning a little more about the Guild, meeting and supporting its membership and working with the executive committee and sub committees to carry on the excellent work of the outgoing team. We are just two weeks away from our Annual General Meeting in New Alresford and our Officer elections will be taking place there. Members have been encouraged to stand for office. I’m pleased we were able to report last week that a candidate has come forward for the post of Master – Mike Winterbourne of Andover District. Michael Church has advised me that he is willing to stand for election as one of the five Central Council Representatives. I wish to stand for election to the post of Public Relations Officer. These declared intentions do not preclude other nominations for the same posts. It is likely that nominations will be made from the floor of the meeting on 2nd July and they can be made in advance of the meeting. Each candidate is required to provide a formal Proposer and Seconder. These two members could be present at the A.G.M. or, if either or both are unable to attend the meeting, they can contact Mo Routh, Honorary General Secretary with their nominations. If they are not going to be present at the AGM, please make sure she receives the details of candidate, proposer and seconder by the evening of Friday 1st July. There is no need for advance notice if the proposer and seconder will be at the meeting. To be elected on, and to serve for 3 years from, Saturday 2nd July 2016 to the 2019 Guild A.G.M. 5 Central Council Representatives – to be elected on Saturday 2nd July 2016 and to serve for 3 years from the Central Council Annual Conference in May 2017 to be held in Edinburgh. There were moves towards “Change” at the recent C.C.C.B.R. annual conference in Portsmouth. So, a really good opportunity here for some of us to mould the future of ringing. If you are considering volunteering to serve as an Officer and would like more information, please contact me by email using the form below, then I’d be pleased to ‘phone you if you wanted to talk in detail. 10.00 Inter District 8 Bell Striking Competition at St John’s Church, New Alresford. Come and support your district team! From 11.00 onwards there will be a display about ART and ringing training in the John Pearson Hall, next to the church. Do come and ask questions! The results of the striking competition will be given during or after lunch. To book a Ploughman’s Lunch, please contact Elizabeth Johnson, 01962 733266 or email Bruce Purvis, giving name and number of lunches required. 2 Inter-District Striking Competition results. Also Martin Routh, former Tower Captain at Amport, Colin Nicholson, first Tower Captain at St Peter Port Guernsey and Keith Williamson formerly of Liss. 7 Life Membership – for fifty years continuous membership. 17 June 2017 To be held in the Christchurch and Southampton District. The 2016 AGM is just eight weeks away. This is an election year for all the Guild Officer positions. Please give serious thought to who might fill these roles and consult as widely as possible to find the best people for the jobs. We want everyone to be aware of these elections. As was advised at the March Executive Committee Meeting, please bear in mind that the four Principal Officers currently in post are unable to stand for election but will offer as much support as possible to the new Officers to facilitate an effective succession process. The following suggestions may be helpful to members thinking of offering themselves for election. The descriptions are in no way exhaustive but are intended to give a feel for some of the offices. 1 Put simply, Officers aim to further the Objects and Aims of the Guild – essentially that is to encourage more and better ringing, good bell maintenance and safe practice by uniting ringers for mutual support. 2 The Guild organises meetings, practices and events. You may well be involved in the planning of these. 3 Good communications are always important. Simply talking to as many people as possible at Guild or District events helps enormously. 4 District members may come to you for help and advice on matters concerning their bells and ringing in their tower. Other Officers and Committees are available for advice and support. The figure head of the Guild, represents the Guild to outside bodies and chairs Guild meetings, The Annual General Meeting and any extraordinary meeting that may be called and meetings of the Guild Executive Committee; attends meetings of the Bell Restoration Trustees and the District Officers’ Forum. It is desirable to attend some meetings of the various Committees of the Guild. This should all be done in an efficient and friendly manner. In co-operation with your deputy attend the District Annual Meetings, co-ordinate the work of the other Officers and make sure nothing is left undone. In conjunction with other officers make policy and the day-to-day for the Guild. You are one of the Trustees of the Bell Restoration Fund, a Registered Charity. To support the Master in the above duties and deputise as required. To receive and account for all monies paid to the Guild and make payments as may be required and authorised. To keep accurate records, and draw up annual accounts. You are one of the Trustees of the Bell Restoration Fund and would be expected to be the Treasurer of the fund, keeping necessary records and preparing and submitting accounts as required of a Registered Charity. You will chair the meetings of the Trustees. re-orders when necessary. You prepare agendas for meetings, calling in reports, budget bids, and papers for discussion from the other officers and committee conveners. In conjunction with other officers make policy and the day-to-day decisions for the Guild. You are one of the Trustees of the Bell Restoration Fund and will act as its secretary.